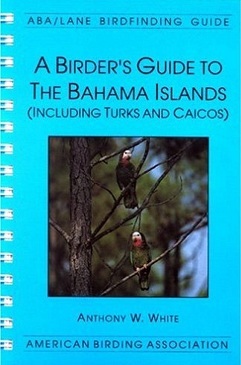 A Birder's Guide to the Bahamas by Tony White is the first comprehensive guide to finding birds on the islands of The Bahamas and The Turks and Caicos. The islands host an unusual mix of Caribbean and North American species, with over 300 bird species recorded. There are three endemic species: Bahama Woodstar, Bahama Swallow, and Bahama Yellowthroat, and a host of other specialties, including such birds as West Indian Whistling-Duck, White-cheeked Pintail, Key West Quail-Dove, Great Lizard-Cuckoo, Cuban Emerald, West Indian Woodpecker, Bahama Mockingbird, Olive-capped Warbler, Stripe-headed Tanager, Greater Antillean Bullfinch, and Black-cowled Oriole. Seabird nesting colonies through the islands and cays host nesting Audubon's Shearwaters, White-tailed Tropicbirds, and eight tern species. The parks and refuges of The Bahamas and The Turks and Caicos protect a great diversity of subtropical birds, among them the Bahama Parrot (an endemic subspecies of Cuban Parrot), and many North American wintering birds, including the endangered Kirtland's Warbler. The New World's largest flamingo colony nests on Great Inagua in the southern Bahamas, where thousands of Greater Flamingos are protected by the country's largest national park. These fantastic birding opportunities, combined with the Bahamas' spectacular turquoise waters and a glorious tropical climate, will make the Bahamas one of the top new destinations for North America's traveling birders. A Birder's Guide to the Bahamas—with complete descriptions by Tony White of more than 150 birding sites—guides birders to all of the major islands, numerous smaller cays, and the less developed 'Family Islands.' ABA's first non-North American guide (and the 15th book in the ABA/Lane series) also features a beautiful eight-page 'Photo Gallery' of many of the Bahamian specialty birds, several of which show up with some regularity in Florida. 302 pages.